Composable Nomination Classic Gold and Enamel Sport American Football Rugby Charm, a stainless steel base link with 18ct Gold and Enamel. Composable Nomination Classic Gold and Enamel Sport Basketball Charm, a stainless steel base link with 18ct Gold and Enamel. Composable Nomination Classic Gold and Enamel Sport Black and Blue Football Boot Charm, a stainless steel base link with 18ct Gold and Enamel. Composable Nomination Classic Gold and Enamel Sport Black and Blue Football Charm, a stainless steel base link with 18ct Gold and Enamel. Composable Nomination Classic Gold and Enamel Sport White and Light Blue Shield Charm, a stainless steel base link with 18ct Gold and Enamel. 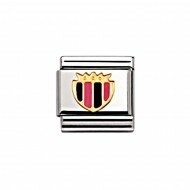 Composable Nomination Classic Gold and Enamel Sport Black and Pink Shield Charm, a stainless steel base link with 18ct Gold and Enamel. 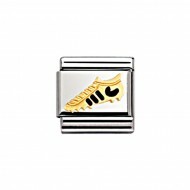 Composable Nomination Classic Gold and Enamel Sport Black and White Football Boot Charm, a stainless steel base link with 18ct Gold and Enamel. ComposableNomination Classic Gold and Enamel Sport Black and White Football Charm, a stainless steel base link with 18ct Gold and Enamel. Composable Nomination Classic Gold and Enamel Sport Black and White Shield Charm, a stainless steel base link with 18ct Gold and Enamel. Composable Nomination Classic Gold and Enamel Sport Black Football Boot Charm, a stainless steel base link with 18ct Gold and Enamel. Composable Nomination Classic Gold and Enamel Sport Blue and Red Shield Charm, a stainless steel base link with 18ct Gold and Enamel. 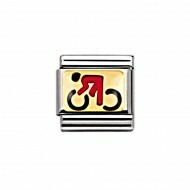 Composable Nomination Classic Gold and Enamel Sport Cycling Charm, a stainless steel base link with 18ct Gold and Enamel. Composable Nomination Classic Gold and Enamel Sport Formula 1 Charm, a stainless steel base link with 18ct Gold and Enamel. Composable Nomination Classic Gold and Enamel Sport Green, White and Red Shield Charm, a stainless steel base link with 18ct Gold and Enamel. 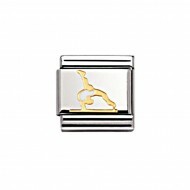 Composable Nomination Classic Gold and Enamel Sport Gymnastics 1 Charm, a stainless steel base link with 18ct Gold and Enamel. Composable Nomination Classic Gold and Enamel Sport Gymnastics 2 Charm, a stainless steel base link with 18ct Gold and Enamel. 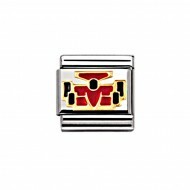 Composable Nomination Classic Gold and Enamel Sport Karate Charm, a stainless steel base link with 18ct Gold and Enamel. Composable Nomination Classic Gold and Enamel Sport Light Blue and Blue Football Charm, a stainless steel base link with 18ct Gold and Enamel. Composable Nomination Classic Gold and Enamel Sport Light Blue and Blue Shield Charm, a stainless steel base link with 18ct Gold and Enamel. 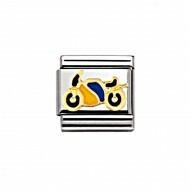 Composable Nomination Classic Gold and Enamel Sport Motorcycling Charm, a stainless steel base link with 18ct Gold and Enamel. Composable Nomination Classic Gold and Enamel Sport Red and Black Football Boot Charm, a stainless steel base link with 18ct Gold and Enamel. Composable Nomination Classic Gold and Enamel Sport Red and Black Football Charm, a stainless steel base link with 18ct Gold and Enamel. Composable Nomination Classic Gold and Enamel Sport Red and Black Shield Charm, a stainless steel base link with 18ct Gold and Enamel. Composable Nomination Classic Gold and Enamel Sport Red and Blue Football Boot Charm, a stainless steel base link with 18ct Gold and Enamel. Composable Nomination Classic Gold and Enamel Sport Red and Blue Football Charm, a stainless steel base link with 18ct Gold and Enamel. 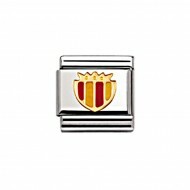 Composable Nomination Classic Gold and Enamel Sport Red and Yellow Shield Charm, a stainless steel base link with 18ct Gold and Enamel. Composable Nomination Classic Gold and Enamel Sport Skiing Charm, a stainless steel base link with 18ct Gold and Enamel. 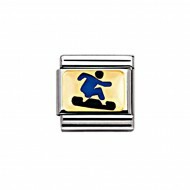 Composable Nomination Classic Gold and Enamel Sport Snowboarding Charm, a stainless steel base link with 18ct Gold and Enamel. Composable Nomination Classic Gold and Enamel Sport Soccer Football Charm, a stainless steel base link with 18ct Gold and Enamel. 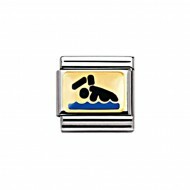 Composable Nomination Classic Gold and Enamel Sport Swimming Charm, a stainless steel base link with 18ct Gold and Enamel. Composable Nomination Classic Gold and Enamel Sport T-Shirt No 10 Charm, a stainless steel base link with 18ct Gold and Enamel. Composable Nomination Classic Gold and Enamel Sport T-Shirt No 9 Charm, a stainless steel base link with 18ct Gold and Enamel. Composable Nomination Classic Gold and Enamel Sport Tennis Charm, a stainless steel base link with 18ct Gold and Enamel. Composable Nomination Classic Gold and Enamel Sport Violet Football Boot Charm, a stainless steel base link with 18ct Gold and Enamel. Composable Nomination Classic Gold and Enamel Sport Violet Shield Charm, a stainless steel base link with 18ct Gold and Enamel. Composable Nomination Classic Gold and Enamel Sport Volleyball Charm, a stainless steel base link with 18ct Gold and Enamel. Composable Nomination Classic Gold and Enamel Sport White and Blue Football Boot Charm, a stainless steel base link with 18ct Gold and Enamel. Composable Nomination Classic Gold and Enamel Sport White and Blue Football Charm, a stainless steel base link with 18ct Gold and Enamel. Composable Nomination Classic Gold and Enamel Sport White and Blue Shield Charm, a stainless steel base link with 18ct Gold and Enamel. Composable Nomination Classic Gold and Enamel Sport White and Green Football Boot Charm, a stainless steel base link with 18ct Gold and Enamel. Composable Nomination Classic Gold and Enamel Sport White and Green Football Charm, a stainless steel base link with 18ct Gold and Enamel. Composable Nomination Classic Gold and Enamel Sport White and Green Shield Charm, a stainless steel base link with 18ct Gold and Enamel. ComposableNomination Classic Gold and Enamel Sport White and Red Football Charm, a stainless steel base link with 18ct Gold and Enamel. Composable Nomination Classic Gold and Enamel Sport White and Red Shield Charm, a stainless steel base link with 18ct Gold and Enamel. Composable Nomination Classic Gold and Enamel Sport White and Violet Football Charm, a stainless steel base link with 18ct Gold and Enamel. Composable Nomination Classic Gold and Enamel Sport White, Blue, Black and Red Shield Charm, a stainless steel base link with 18ct Gold and Enamel. Composable Nomination Classic Gold and Enamel Sport Yellow and Black Football Boot Charm, a stainless steel base link with 18ct Gold and Enamel. Composable Nomination Classic Gold and Enamel Sport Yellow and Black Football Charm, a stainless steel base link with 18ct Gold and Enamel. Composable Nomination Classic Gold and Enamel Sport Yellow and Black Shield Charm, a stainless steel base link with 18ct Gold and Enamel. ComposableNomination Classic Gold and Enamel Sport Yellow and Blue Football Boot Charm, a stainless steel base link with 18ct Gold and Enamel. Composable Nomination Classic Gold and Enamel Sport Yellow and Blue Football Charm, a stainless steel base link with 18ct Gold and Enamel. Composable Nomination Classic Gold and Enamel Sport Yellow and Blue Shield Charm, a stainless steel base link with 18ct Gold and Enamel. Composable Nomination Classic Gold and Enamel Sport Yellow and Red Football Boot Charm, a stainless steel base link with 18ct Gold and Enamel. Composable Nomination Classic Gold and Enamel Sport Yellow and Red Football Charm, a stainless steel base link with 18ct Gold and Enamel.